Robin Lee Visuals-Surfing Baler, Philippines. Three weeks before this trip my friend called me up and asked if I wanted to go to the Philippines on a Surf trip. He said "It's cheap as chips mate We will spend less there then we will at home" and I was sold. I checked the dairy and had nothing on so I thought why not. There are many surf spots to go in the Philippines but they are becoming incredible popular due to the high quality of waves and as I stated earlier, cheap Island life. So we picked Baler, a lesser known spot where we were hoping for less crowds. Baler delivered. Not only were we among the few few foreigners but the lineups were generally small and in some spots we were the only ones there. The locals there were super friendly and happy to show us around to the best spots and give us pointers along the way. Being only a year into surfing myself this was awesome! The surfers include myself (but only a couple shots), my friend Andrew and our surf guide Mike. 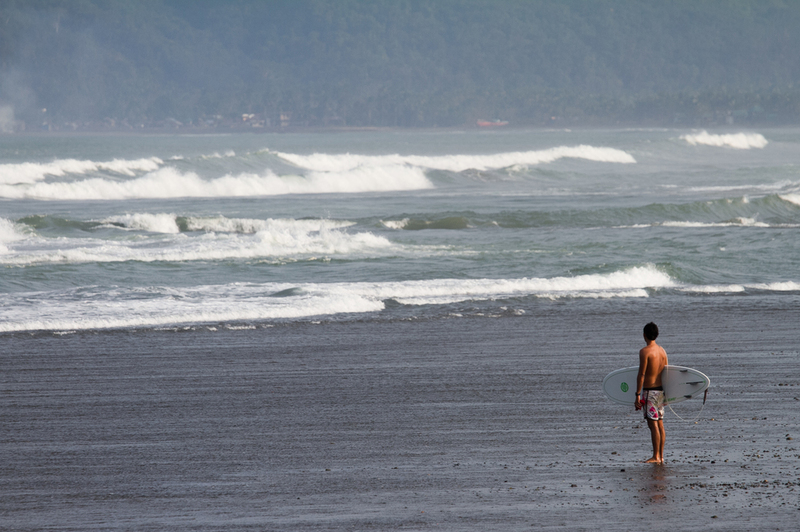 It also includes surfing from Leo a friend we met whist we were there and several locals who welcomed us from day one! This was my first time filming surfing and I knew that it was going to be very different from any other filming I had done. Unlike a lot of sports surfing has the potential for the surfer to be very far away from the camera depending on each break. I had my trusted 70-200mm lens with me but knew that it probably would not be enough - even on a 1.6x crop body camera (7D) - so I bought a 1.4x extender. A cheaper alternative then buying a whole new lens just for a single trip, but something I knew I would use again for sports such as rugby and skiing. This gave me a max focal length of 448mm. Plenty. Another way you could get really close would be to get in the water itself with a waterproof housing for you camera. This again adds more cost to the project so this time I didn't want to purchase any more equipment but found myself really wanting one when we were there. I did have a GoPro that we could use but we only used that for B-Roll and some simple fun stuff. Hope you enjoy and below are a few of my favourite snaps from the trip. Stunning backdrop to our favourite surf sport on the trip, Cemento Reef or locally known as Cobra Reef. Have to trek 15 mins over a shallow and sharp reef to get there first though. Don't try go barefoot, took us 15 mins extra and caused several cut feet. The lonely surfer. Secret spot. Our surf guide Mike. Took us all round Baler not just the surf spots. Legend. When the boat breaks down there is only one thing to do. Pull it. Our mode of transport for the two weeks. Saw a maximum of 7 people on one of these while we were there... no wonder it broke down so much. Our man Mike's rad tricycle paint job! Misty waters. Long exposure, Cemento. Cemento rock! Checking out the surf before the paddle out. One last long exposure from Cemento with the famous rock behind.